I posted them already, though I reran PNGGauntlet on the full castle on my work computer this morning and managed to shave off another 22 kB, so I'll put that slightly trimmed one up tonight. I've mentioned before that I've found PNGGauntlet sometimes has different results when run on different computers. Thanks, Jon. I think it has to do with the initial values which might be different on different computers. pngout lets you tell it to use randomized tables, which can make it a difference if you run it multiple times. It's usually a very small percent, though, so I don't usually bother. 22kb isn't much in comparison to the 7+ MB that had already been saved. I'll post some more details later, but until then, enjoy! Did you really recapture everything, or did you reuse as much of the Normal Castle maps as possible, only changing the palettes as needed? I'm asking because unlike Harmony of Dissonance, both castles are almost fully identical aside from items and some areas getting a slightly coloured filter. Congrats, and awesome job! What an awesome Hallowe'en surprise. Since you've already posted it, Revned, I've made a tease of it on the Facebook and Twitter with the hashtag #DraculaBackwardsAndUpsideDown. The maps will be up as soon as I get home. I'll try to grab the full castle again here since email seems to have failed us. I feel bad for asking for more, but will you be putting both castle maps into a single image to make one super-humongous complete map? After my last round of revisions to the old maps I managed to keep some momentum. I mapped "Cave" just to see how hard palette shifting would be. Turned out that it was pretty easy! I finished that in a few days and then tried my hand at a couple more. On about October 1st I realized that it would be awesome to finish in time for Halloween. It required me to do one map every three days, though, which was not a whole lot of time. I managed to keep up, and it was definitely worth it! The self-imposed deadline actually helped quite a bit. These went pretty smoothly because as mentioned, they're almost identical except for the altered palettes. I could use the original maps for most of them and then just take enough sample screenshots to get an adequate palette sample. When that didn't work, it was still easy to remap things manually thanks to there being essentially zero unknowns. I knew exactly what needed to be done, and I even had fully masked references on hand. I'm glad I went ahead and filled in the partial tiles on the original maps, because that allowed me to reuse the graphics directly. It's not immediately obvious, but every area does actually have a different palette. The Keep is the most similar, but it has slightly higher contrast in the Inverted Castle. While working on these, I did run into a bunch of minor issues in my original maps. I mean, really, really minor. Like single stray pixels. I made a big list and plan to go through and address them, then I can finally, truly call the maps done. At that point I'll put together a full map with both castles and the forest segment. One other thing I would like to do is "fix" the graphics in the Saturn maps where they're stretched. As mentioned sometime before, the sprites are not distorted, so I'm going to have to use my best judgement to reconstruct things as best I can. I actually worked on the Cursed Prison map today and it's looking good. 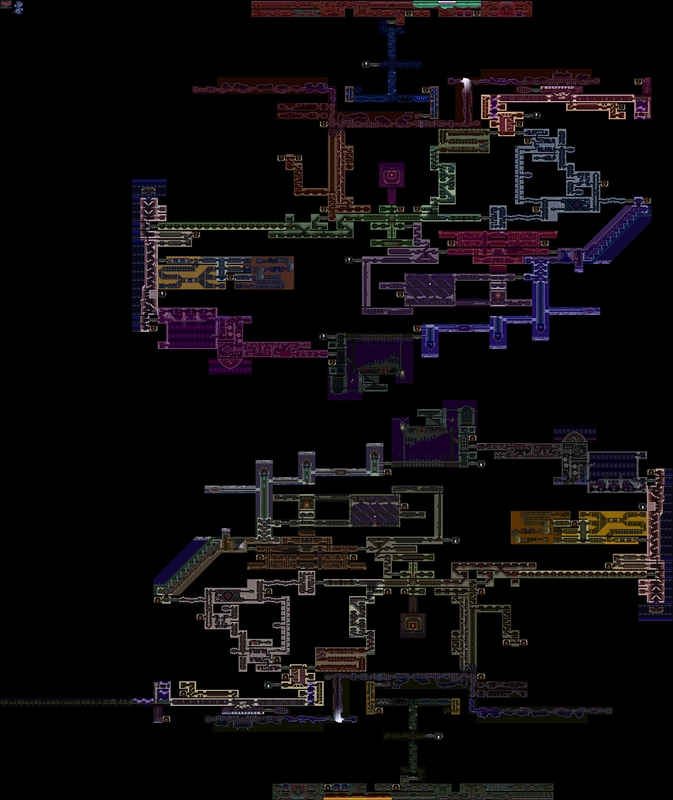 Once I do all four of those, I'll make a super special edition map with both castles and all Saturn areas. I'm so close to finishing this up for good that I'm going to try really hard to keep my momentum, so stay tuned! I could be wrong but SOTN is probably the hardest game to map out. It's been quite a while since it started being mapped. I'mma go out on a limb here and assume there has been many headaches on the creation of this one. It would have been much better if all you had to do was just flip the original map upside down.. BUT no can do. Good work. It's really large and over 51000 colors. Perhaps someone could maybe explain what the purpose behind the inverted playthrough of the castle represents? Maybe some twisted plot scheme, or maybe they just put it in there to add to the gameplay time. Its to add gameplay. Remember this was made when platformers were just breaking out of 16 bit. If you're a programmer or designer you've got all that space on a CD you didn't have on a cart that even super rich graphics and music don't fill up. So let's just make the game itself a whole lot bigger. There is a "bad" ending if you fail to obtain and use a particular item when you get to the boss fight at the top of the first castle. If you do find the item and use it, you find there's more than it seems, and so the second castle that appears from the sky doubles the size of the game as you work towards the "true" ending. It's an interesting and exciting development to the story. Instead of working towards 100% completion you can now shoot for 200%. Two castles are also seen in the later-released Castlevania: Harmony Of Dissonance for the GBA, but they are both right-side-up, and is more like a two-world thing, like seen in Final Fantasy V, Chrono Trigger (600 AD and 1000 AD in particular), The Legend Of Zelda: A Link To The Past/Ocarina Of Time/Oracle Of Ages/A Link Between Worlds, most Silent Hill games, and probably other games I can't recall at this particular moment. It's not an uncommon theme. But in Castlevania: Symphony Of The Night, instead of being just a parallel world, the other "world" is upside-down, which provides interesting architecture, an obvious yet ominous otherworldliness, and also means the overall map is much larger. There is a dungeon in The Legend Of Zelda: Majora's Mask that flips, and is neat in its own way, but Symphony Of The Night's upside-down castle came first, and it is more than just a 180-degree rotation or a "twisted reflection"....it's a "twisted rotation"? (Isn't that redundant?) Whatever it is, it's awesome! As you can tell, I love it, and can't wait for Revned to do his final tweaks and complete a full map showing both castles together in a single image! It's going to be huge! I gave up on the full PSX+Saturn map I'd mentioned before. I did manage to "fix" the Prison areas, but the Garden areas had too much of a mix of distorted and non-distorted graphics for me to feasibly fix. Would have taken forever to tease them apart, and then I'd have to do a lot of custom work to get them squish things back down. Ah well, not like the Saturn areas are worth the trouble. They don't fit the visual style at all. Not going to lie, I'm quite glad to put this behind me after so long. How rude of me to still not have even commented on this topic yet since the achievement of completing both castles of Castlevania: Symphony Of The Night, and compiling them into a single image! Wow, it is really something. Thank you so much, Revned! 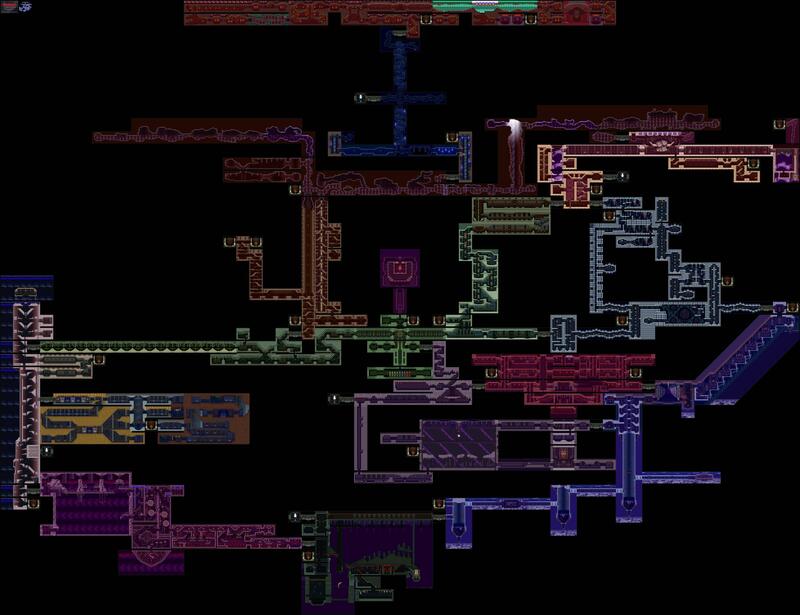 If you remember my GameSHOUT.com interview from over nine and a half years ago (not to mention several comments I've probably made before and since then), you would know that this is one of the dream maps I have always wanted to see...if not THE dream map. But I imagine that at times it must have been a nightmare to put together, since it took a couple years for the first castle alone, didn't it? It's obvious there are certain genres of games that make for more impressive maps, and the more complex a game is, the more practical value there is, like something you'd see in a strategy guide. (That's not to say I don't love arcade game maps, as I do, but for different reasons.) While I love most console RPG map sets, they are often too big and disjointed to put into a single image or even a few...you'll have an overworld map, and then you'll have towns and castles and dungeons, but with some noticeable exceptions like the Ultima games (Zerker's Ultima VI: The False Prophet (PC) map of Britannia is another map I cherish, though I would still like to see the Gargoyle World...though, FlyingArmor did both for the Super NES version) they are usually not continuous...that is, you step onto a sprite/icon that represents a location and you're taken into its map, which is a separate one at a different scale. These map sets are better suited to one image per map. But the entirety of most "Metroidvania" games (is there a better name for this genre?) can each fit into a single image because they are continuous. This makes them more impressive than other platformers, and the variety of areas and "height" make them more interesting than even the largest top-down/bird's-eye-view RPG or RTS maps. Castlevania: Symphony Of The Night is the biggest of these "Metroidvania" games, even larger than Super Metroid (though even that is a huge deal, thanks again, Rick Bruns), and the visual spectacle of two castles together, well, that's really something! Since it was "soft-completed" on Hallowe'en, it seems almost criminal to hold on to an inevitable "Maps Of The Month" honour until next October just to theme it alongside next Hallowe'en...maybe I'll find a good opportunity to recognize it earlier. But really, though it will surely get it, until then, I think it really goes without saying that the complete map is incredible. Thank you again, Revned! And thanks also to Edsword, mephea, TerraEsperZ, Wileee, and Zeric for your contributions to the first phase of mapping Castlevania: Symphony Of The Night. That combined map with both castle is so big, attempting to open it drove my computer into a series of seizures where it took me something like six or seven minutes just to bring up the task manager so I could close the application that was choking on it. I was actually surprised to find that my image viewer of choice, which has never failed me, didn't even attempt to render the full map. I had to stick to Photoshop. Just saving the thing took 3 or 4 minutes. Optimizing it took something like 7 hours at 3.5+ghz. I'd really like to see the DS games mapped, but I'm not holding my breath. I tried mapping the intro to Portrait just as an experiment, and I ran into trouble right away in the first room. Lots of overlapping parallax layers with shared colors. And, of course, there are a lot more 3d backgrounds to deal with. I gave up pretty quickly; no way am I going to start on another multi-year project anytime soon. I just finished Dawn of Sorrow and I'm most of the way through Ecclesia. I Successfully mapped a hall in the Demon Guest House from Dawn as a test but damn, so much 3D in the rest of the game. You'd absolutely need a way to do the 3D to get it to look right otherwise you'd have a lot of areas with no background. Think of the ship in the background of the first water area in Ecclesia.